Retro fashion is back. Many new fashion designs are inspired by the 50s, 60s or 70s and many more are direct copies from the past. It has never been a better time to look retro and you don't have to visit a second hand shop to do it. To get a genuine retro fashion look, have a look at our guides to the style of the past and then compare with new items you can buy in the shops today. The original 60s London fashion centre, Carnaby Street, is thriving. There are Ben Sherman and Merc stores and many more outlets selling retro fashion. There are also several online stores specialising in Mod and retro fashion. If you are looking to buy original vintage or retro fashions, why not visit a retro fashion fair? 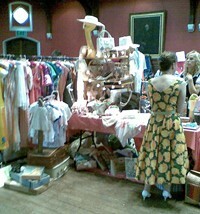 You will have a chance to browse stalls selling original clothes from the 50s, 60s and 70s. 80s fashion is also gaining in popularity: some of the vintage stalls now also feature jackets with shoulder pads and bold 80s patterns. If you run a vintage fashion fair and would like to put your details here, please contact steven@retrowow.co.uk with dates and information. If you have a website, please link back to us.